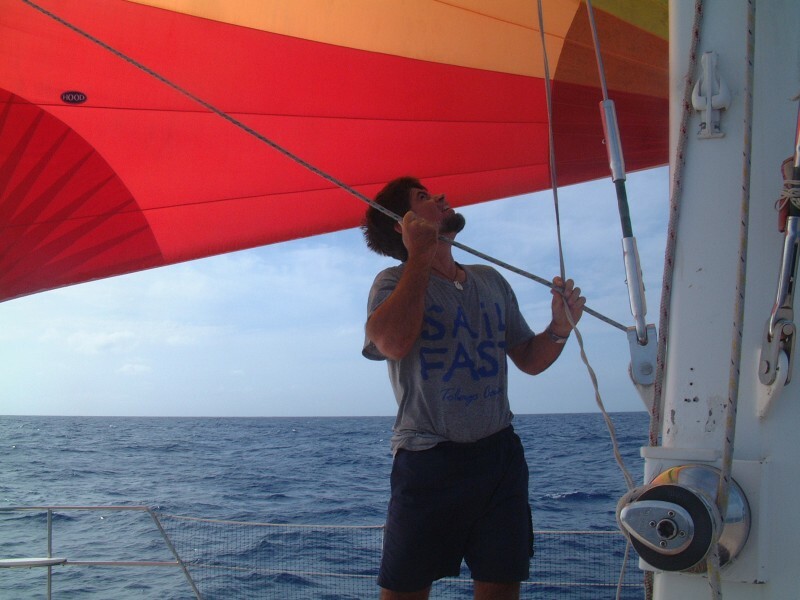 It's wonderful crossing oceans under spinnaker! Friends of ours had gotten pretty beat-up sailing from New Caledonia to Brisbane, Australia, but our passage was generally delightful. A high-pressure system had stalled a bit west of New Zealand and was generating a steady E to ESE wind-flow across the Coral Sea (highs generate counter-clockwise winds in the southern hemisphere). The high had actually been there for much of the time we were enjoying New Caledonia, but we couldn't leave because we still had Tianna on board (and we were having too much fun in New Cal). Unfortunately, by the time we were ready to leave, so was the high - they usually march from west to east pretty quickly, alternating between a high and a low about every 4 days. Luckily, there was another high behind the first one (the intervening low had gone further south, clobbering those boats that went to Lord Howe Island and Sydney). Between the 2 highs was an area of squirrelly winds, but they didn't look too bad - just a narrow band with mainly light and variable winds. So on Monday, 7 November 2005, we jumped off from Amedee Island in New Caledonia, several hours behind Peregrinata and almost a day ahead of Scud (although we actually arrived in reverse order, which was expected). The highs caused us to follow a fairly curved track as we sought to second-guess the wind, but our course decisions seemed to be good ones. Tue 8 23° 22' 164° 06' 142 698 12-18 90-150° Morning squalls, then nice sailing. The newsletters we sent while on passage are shown by date, plus we've included other letters we sent once we arrived in Australia to augment our Australia Destinations pages!